Radcliffe Borough v Brighouse Town''- Thomas Haigh scored two goals. Brighouse Town go into tomorrow’s home Division One North game with Atherton Collieries (3.0) looking for back-to-back victories following their spirited 3-2 success at Radcliffe Borough last Saturday. While Vill Powell’s men were coming back from 2-0 down at half-time to register their first success in the league since September, the Wigan club were losing 5-1 at home to Marine in the second qualifying round of the Buildbase FA Trophy. The last time the clubs met was in the Emirates FA Cup three seasons ago when Town drew 2-2 away in the pouring rain and then won the replay 2-1. Since then Atherton have continued their progress and last season were promoted as champions of the North West Counties Premier Division. They are a well run club from their Alder House base under manager Michael Clegg. While Town have just made goalscoring midfielder Thomas Haigh a contracted player, after early season interest from other clubs, the Colls have contracted talented defender Daniel Lafferty to them this week. The valuable three points picked up at Radcliffe, courtesy of a double from Haigh and a winner from substitute Rhys Jenkinson, put daylight between Town and the two clubs below them, Goole and Ossett Albion, who lost on their travels to Mossley and Hyde respectively. They are now just two points behind a clutch of clubs, including 17th-placed Atherton, so the game is definitely a ‘six pointer’. Powell was assessing the injured players he had to leave out of Saturday’s squad at training last night. 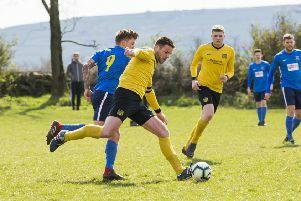 They included utility player Ferdinand Annor, who turned an ankle in training last Thursday and midfielder Callum Robinson, who took a knock in the recent defeat by Farsley Celtic in the West Riding Cupt. There was also no room in the 18 for Jacob Buchanan and the new wide player signed from Harrogate Town, Prince Attakorah, who has represented Ghana at under 17 level. Like club captain Adam Field, coming back from injury, Attakorah needs some game time. Field was due to play for the under-21s in midweek as an allowed over age player at Dennyfield against Thackley. Town have made Saturday’s game one of their three allowed ‘promotions’ with all their local pro sides away or, in the case of Leeds United, on the television at home to Middlesbrough (1.0), on Sunday. Leeds, Huddersfield, Bradford and FC Halifax Town fans can gain entry, on production of their season tickets, for £6 and £4 (concessions) respectively. Lee Ashforth, Town’s assistant manager last season, has joined Ossett Town as assistant manager.